In 2008, the cult novelette 12:00 a.m. Live introduced readers to the sick world of Andy Crow and Charles Green. Joe Carter is a shady security guard with a shameful past. When, in boredom, he tunes into a mysterious shock radio show, he finds himself caught up in a horrifying game in which he is the contestant...and the prize is more terrible than he can imagine. In 2009, The Avian presented the tragic story of Jove. Abandoned at birth, Jove has lived his entire life in a Catholic orphanage. When puberty hits, it brings with it a startling change...Jove is growing wings. As his frightening transformation continues, Jove must confront his faltering faith and learn to embrace his mysterious "gifts". 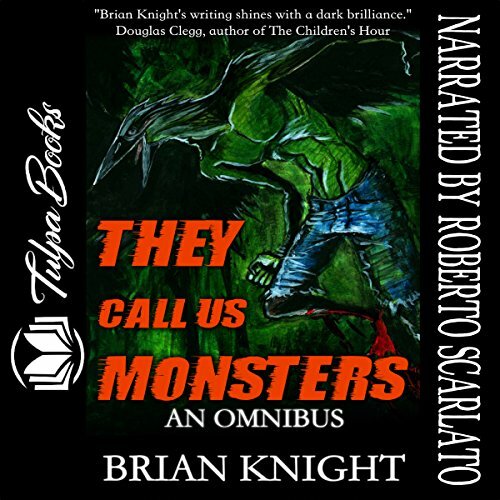 Finally, They Call Us Monsters, a brand new novella and the final book of this amazing fantasy-horror trilogy, brings these characters together and answers it all in an explosive conclusion. For the first time, these beloved characters meet - and all hell breaks loose. This collection includes all three books!